The future USS Thomas Hudner (DDG 116) returns to Bath Iron Works after successfully completing acceptance trials. The Arleigh Burke-class destroyer spent a day underway off the coast of Maine testing many of its onboard systems to validate that their performance met or exceeded Navy specifications. BATH, Maine — Bath Iron Works announced Thursday that the U.S. Navy has awarded it contracts to build four of the 10 Flight III Arleigh Burke-class destroyers to be procured during the next five years. The contracts are worth $3.9 billion, according to a release from the shipyard. The Maine shipyard’s chief competitor, Huntington Ingalls Industries, will build six of the Flight III DDG 51 destroyers. Those six ships carry a contract value of $5.1 billion. Each shipbuilder’s contract includes options for five additional ships in fiscal years 2018 through 2022, according to a release from Sen. Susan Collins, R-Maine. 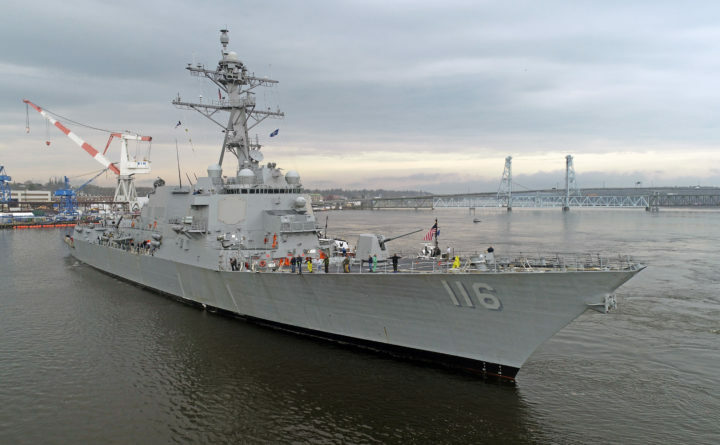 “We are pleased with the opportunity for Bath Iron Works to continue our participation in the DDG 51 Program and to deliver much needed capability to our US. Navy customer,” Dirk Lesko, president of Bath Iron Works, said in the release. Lesko praised Maine’s congressional delegation for their support of Navy shipbuilding and of BIW. Shipyard spokesman David Hench said the company would have no further comment on Thursday. Only BIW and Huntington Ingalls Industries in Pascagoula, Mississippi, build Arleigh Burke-class destroyers, or DDG 51s, for the U.S. Navy. BIW also came up short initially during the last multiyear procurement when the Navy awarded Ingalls five ships but BIW only four. But in 2014 the Department of Defense awarded the Maine shipyard a contract for a fifth ship. But Keenan said he’s not concerned for the immediate viability of the company. Keenan said BIW has begun to again discuss with local vocational schools and high school training students who hope to become shipbuilders, and the company recently opened its own training center. In June of this year, Bath Iron Works was awarded the lead yard contract for Arleigh Burkes potentially worth $305 million. On Wednesday, Congress overwhelmingly passed a $684 billion defense appropriations bill that President Donald Trump has promised to sign, the Military Times reported. With the future USS Thomas Hudner (DDG 116) delivered to the U.S. Navy on June 15, BIW currently has four Arleigh Burkes under construction, as well as the third Zumwalt-class destroyer, the DDG 1002. Construction of the DDG 127 (the future USS Patrick Gallagher) has not yet begun. While employee numbers fluctuate due to workflow, the company currently employs about 5,700 people.